My favorite clock is a grandfather clock that we have owned the past 45 years. It was originally built on the Danish island of Bornholm in 1851. We purchased it from an antique dealer in the old section of Copenhagen, Denmark in 1964. I thought my wife was crazy when she purchased it. A grandfather clock wasn't on my list of critical needs at the time. I've since grown very fond of this old friend. 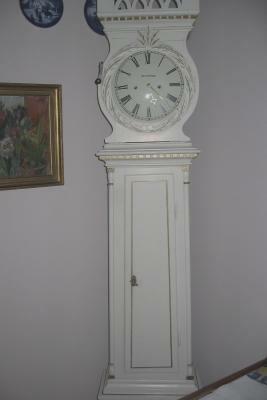 This type of clock is often called a Danish Bornhholm tall case clock, a "Bornholm Ur" in Danish. It has lead weights, each weighing about 8 pounds. The movement at first glance appears rather simplistic but is still a good example of an expert clockmakers art. The clock keeps good time but is very temperamental if moved. The several times we have moved it has taken up to a week of adjusting the base to keep the clock running and running on time. The clock survived a rough transatlantic boat ride in 1965 becoming water soaked but not permanently damaged. We think it's temperamental moments are perhaps a result of memories of that voyage. This style of clock is typical of Bornholm clocks of the 18th and 19th centuries. The general shape (tall or long case) does not vary greatly but the outer casing is often brightly colored. The white casing we have is an exception to the rule. Our Bornholm clock has a nice sounding chime (this also has to be painfully adjusted to get it midway between a dull thud and an angry "clang"). When adjusted just right the chime and the "tick tock" makes for quite a pleasant sound. Not bad for a clock that has been on duty for over 150 years. The maker of the clock was H.P. Ipsen. We tried locate the business but found it has been out of business for many years. I have a Henrich-Olsen no J 23G grandfather clock from my grandparents in Denmark. Is it worth anything. If the name of the dial is H.P.Ipsen, then most likely it is the retailer. The name of the maker is generally on the back of the clock movement. As a point of interest, I had a white wall clock, and was told that it could be a wedding present. I decided to have a cabinet maker strip the paint, to find that underneath was a beautiful mahogany case. With Scandinavian clocks, one would have to make a test first,as generally they are made of pine.